Many of the criteria identified in the Teacher Effectiveness for Language Learning Framework are actions teachers take outside of their actual “teaching” time, like creating the learning environment, planning to teach, selecting resources, working with stakeholders and being active members of the profession. As such, evidence of these criteria may not be observable during a classroom visit. Yet all of the criteria related to the actual learning experience and many of those associated with performance and feedback are easily observable behaviors that effective teachers evidence. Since the TELL Project stems from a desire to help teachers grow, providing and receiving feedback on teacher practice is an extremely valuable component of that growth. To that end, several feedback tools are provided for teachers and other professionals to use as they visit classrooms and provide feedback. Many of the criteria in the Teacher Effectiveness for Language Learning Framework are observable as a teacher engages students in learning. 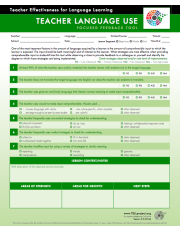 This tool, intended for use during a full class period or lesson, captures those criteria and allows the observer to catalog what is seen and provides a document from which feedback can be given. One of the criteria identified in the Teacher Effectiveness for Language Learning Framework addresses the need to “frequently check for understanding in a variety of ways throughout the lesson” (LE4e). What strategies can you use to effectively check for understanding? Use this tool while observing a class to provide feedback to a colleague or yourself and identify the degree to which those strategies are being implemented. Building relationships with students is the first step to an effective learning experience. Effective teachers facilitate interactions with respect, routines and regard for each student as an individual. What are those strategies you can use to develop rapport with students so you may better facilitate classroom interactions? Several of the criteria identified in the Teacher Effectiveness for Language Learning Framework address the need for engagement of all students. What strategies can you use to design learning experiences that keep all students engaged all of the time? Use this tools while observing a class to provide feedback to a colleague or yourself and identify the degree to which those strategies are being implemented. Criteria identified in the Teacher Effectiveness for Language Learning Framework address the need for using strategically selected resources designed to support intentionally planned course, unit, and lesson performance objectives. How do you use learning tools that facilitate language learning experiences? Use this tool while observing a class to provide feedback to a colleague or yourself and identify the degree to which learning tools are being used effectively. One of the criteria identified in the Teacher Effectiveness for Language Learning Framework addresses the need for “students to engage daily in pair and/or small group activities” (LE5d). When students work cooperatively in pairs and/or small groups they are often more willing to speak and their opportunities for language use are multiplied substantially. How do you use pair and small group work in the classroom? 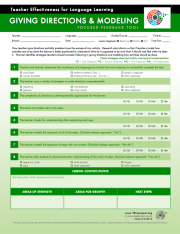 Use this tool while observing a class to provide feedback to a colleague or yourself and identify the degree to which effective pair and small group work strategies are being implemented. Effective language learning experiences are carefully orchestrated by a teacher working with students to create an environment where they are safe and can flourish and that can support the identified learning performance objectives. What is essential in creating a highly effective learning environment? Use this tool while observing a class to provide feedback to a colleague or yourself and identify the degree to which strategies for creating an effective learning environment are implemented. How teachers give directions partially predetermines the success of any activity. Research also informs us that if teachers model how activities are to be done the learner is better positioned to understand what he is supposed to do and what it should look like when he does it. This tool identifies strategies teachers should consider following in giving directions and modeling how activities should be done. Providing students opportunities to practice language within the modes of communication and in meaningful contexts is essential to grow their linguistic capabilities. How often and what kinds of opportunities do you provide students to use their new language skills? Use this tool while observing a class to provide feedback to a colleague or yourself to identify how much and what kind of language students are using. One of the most important factors in how much language is acquired by a learner is the amount of comprehensible input to which the learner is exposed. The input should be both meaningful and of interest to the learner. What strategies are most effective when providing comprehensible input to students? Use this tool while observing a class to provide feedback to a colleague or yourself and identify the degree to which those strategies are being implemented. How Do I use the Focused Feedback Tools? Designed to capture snapshots of practice through a series of short drop-in visits, these tools, when used over time, will cause patterns of strengths and areas of potential growth to emerge. Below are descriptions of some of the many ways these tools can be used. Before observing the teacher, the administrator, supervisor or learning coach reviews the teacher’s goals and selects the feedback tool that directly supports the teacher’s TELL Growth Plan. Over a period of time, the observer makes brief visits into the teacher’s classroom and collects evidence that is recorded on the feedback tool. Once several visits have been completed, the teacher and the observer sit down to look at the series of documents and analyze the data and look for trends. Those trends may be areas of strength, areas that were not observed, or areas of inconsistency. A discussion of the data should yield next steps for the teacher to take in order to continue to grow. The process is then repeated to validate the changes in practice and to continue growth. In some cases, teachers may not have completed a growth plan. The observer may want to show the tools to the teacher and discuss the possibility of the teacher’s selecting a focus area to work on for a given period of time. This can serve as another way of helping teachers become familiar with the TELL Framework and see how it can be used for more intentional professional growth. A teacher may ask a colleague to drop in during their planning period to collect evidence over a series of days or weeks. Once several visits have been completed, the teacher and observer sit down to look at the series of documents to analyze the data and look for trends. Those trends may be areas of strength, areas that were been captured, or areas of inconsistency. A discussion of the data should yield next steps for the teacher to take in order to continue to grow. The process is then repeated to validate the changes in practice and to continue growth. This process can be particularly effective when teachers observe one another and then evaluate their data together. Often a true synergy emerges and the process of growth is accelerated. A teacher may record certain classes and use the feedback tool as a reflective tool to guide analysis of the video. Over a series of videos the individual teacher can look for trends in the data. Those trends may be areas of strength, areas that were not been captured, or areas of inconsistency. Reflection on the data should yield next steps for the teacher to take in order to continue to grow. The process can then be repeated to validate the changes in practice and to continue growth. The group leader or university instructor could select a video clip on a particular topic. PLC/class participants could then use the feedback tool to guide their observation of the video and subsequent discussion of evidence as a learning tool. This process can be repeated with different video clips using the same feedback tool or different ones. A mentor teacher can encourage a student teacher to set goals for growth from the very beginning of a teaching career. The student teacher can use the mentor teacher’s class as a vehicle to collect data either by recording the class or by asking the mentor teacher to collect evidence during the class. The evidence that is collected provides a tool to guide the mentor teacher and student teacher in their collaboration as they prepare the student teacher to work as an independent practitioner. Another possible scenario is that a student teacher has set a personal goal. The student teacher then uses the mentor teacher’s class as a vehicle of collecting data. Likewise the mentor teacher can give the student teacher feedback on the lesson segments using the same tool.